TO INSPIRE FAITH. MAKING THE IMPOSSIBLE POSSIBLE. Choon Heng Logistics was founded in 1981 and is headquartered in Singapore. Gaining over 35 years of experience, Choon Heng Group has become an iconic name in transportation services Singapore. We are a modern, vision-driven, and rapidly developing group of companies. Being the prime mover in Singapore, we offer a wide range of logistical services to meet the complex needs of the most innovative and sophisticated companies. Choon Heng Logistics is one of the few “holistic logistic solution providers” for all your transportation, logistics and supply chain requirements. We are an asset-based company with large fleets comprising of trucks, trailers, warehouses and IT-based infrastructure for seamless tracking and tracing. We apply the latest GPS based fleet management and tracking solutions. We are driving our own development to provide a wide array of incredible transportation and logistics services to our client partners. As a group, Choon Heng provides Contract Logistics, Freight Logistics, Port Logistics, Turn-key project logistics, and Warehousing. In the recent year, several developments have moved us forward and together with our subsidiaries, we offer last-mile delivery, truck and truck parts dealership, and truck maintenance. Today we are able to offer complex and holistic logistic solution. We are the prime mover trucking company in the Singapore and we thoroughly believe that “the key to success” is to always integrate with our customers to make their transport solutions as seamless as possible. We are committed to realizing their logistics needs at an optimum cost, enabling gain competitive advantages by virtue of better logistics support through our matchless logistic services. Choon Heng Logistics is the core business entity of Choon Heng Group, a leading brand in transportation services and a specialist in bulk transport, container hauling and transport of dangerous goods. Our strength lies in the wealth of our experience of working with so many different industries, handling their logistic services, that we are known for precision when it comes to planning, time, technical execution and safety. We see ourselves as partners to provide our customers with transport and value- added services. We analyse highly complex logistics operations and optimise them using individual solutions that cover planning, process design and distribution. We integrate and journey with you: regardless of the size of your operations, we will support you as you expand and conquer new territories as we are the Prime Mover in Singapore. We place serious focus on safety. Besides the many services we provide, we are known to be specialists with handling dangerous liquids, gas and waste which requires high level of safety standard handling, precision and planning. Our drivers are experienced with loading processes with strictest safety requirements as they frequent chemical plants, cryogenic gas suppliers and power stations. We exact qualities of OTIF, Hygiene and Quality while ensuring deliveries are damage free. Safety is ingrained in our identity and transcends every transport we do. It doesn’t matter if we handle hazardous gases or tropical fruits. We ensure your precious goods are kept safe, as much as people and environment. Quality is a natural outcome of our focus on safety and precision. Our fleet is well- equipped for every job and our drivers very experiences, yet continuously trained. The result is that your consignment arrives on time and in perfect condition. Our assets and team is prepared for a wide variety of jobs. But we have an even wider network of partners and specialist. For example, we work closely with suppliers and can support back-end requirements of setting up tanks at our facilities. We have a large modern warehouse and container depot that enables us to provide many value-added services. We control stock count with live updates on all movements within our warehouse and manage the cargo movement from raw input to storing, handling, and tracking while fulfilling our customer’s daily production requests. We believe that the impossible can be made possible. 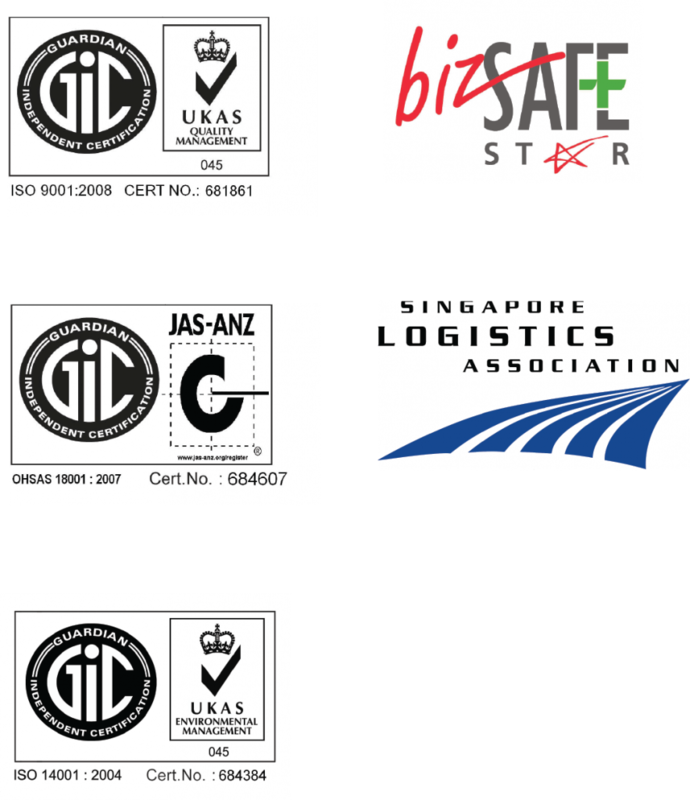 We prove this daily as trusted partner of many international and local companies that rely on us to keep their precious goods and materials safe, moving and arrive on time. As one of the fastest growing logistic infrastructure providers, our trucks and minds are tirelessly moving, helping to maximize our clients advantage and build a greater future for our nation. We are a Singapore company with global human values. Our values are truly our guiding compass and show up in everything we do. We strive to achieve a high standard of true professionalism by providing innovative logistical and transportation solutions custom-tailored to the requirements of our customers. We focus on our 3 key resources – vehicles, systems and manpower, which helps us to deliver the most complex cargo with ease.